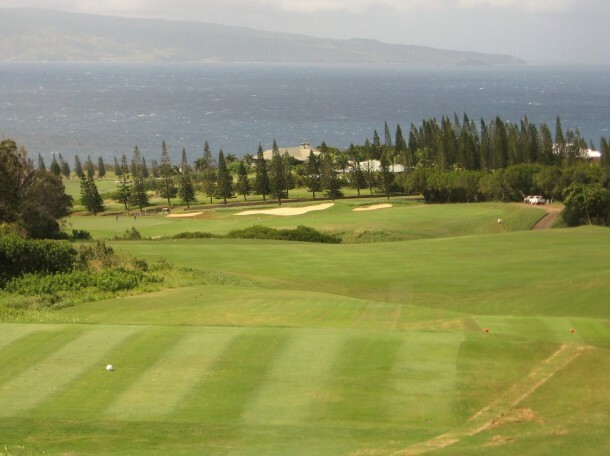 The Plantation Course at Kapalua was one of C&Cs early projects and it really put them on the map as an up and coming design team of significant merit. 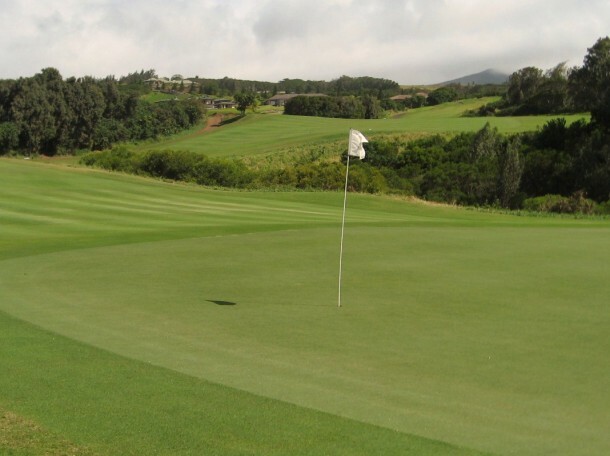 One word comes to mind while playing The Plantation – FUN! 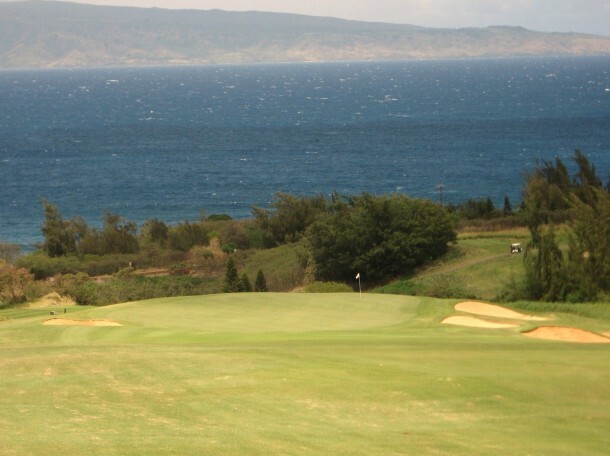 400 yard drives, strong trade winds, downhill approach shots, bump and runs, incredible views, and so on and so forth. 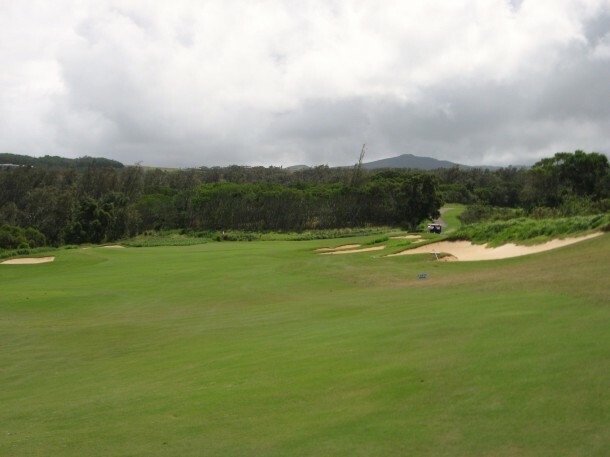 This is a really enjoyable golf course, but it is not easy so bring some ammo. 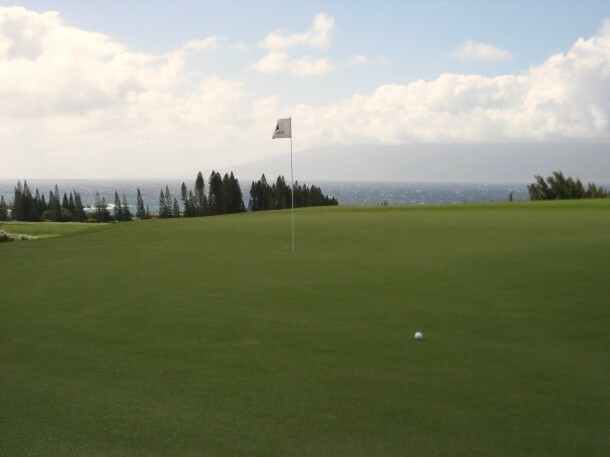 The greens are somewhat unique as the grain, which runs towards the Pacific, often impacts the line and speed of the putt. 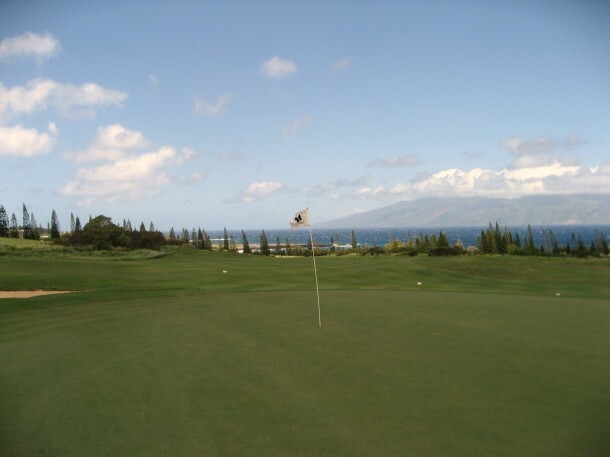 The large greens have quite a bit of undulation and they are a blast to play. 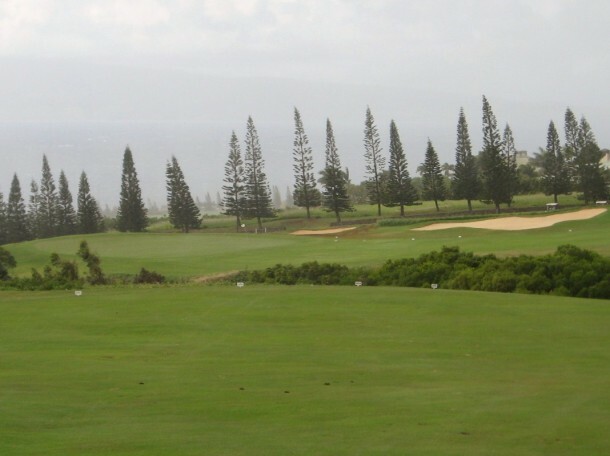 The Plantation is routed over hundreds of acres of old pineapple and agriculture land – up and down the side of the West Maui Mountains at Kapalua. The course is essentially unwalkable due to several long green to tee transfers on the front side. However, caddies and “cart transfers” are available and while the walk is certainly challenging, it is manageable if you are in shape. You will have to hop in a cart between the 5th green and 6th tee, the 8th tee and 8th green and the 9th green to 10th tee. The caddie calls the pro shop and they send someone out to ferry you on these transfers, a nice gesture by the resort for those who REALLY want to walk. On the other holes, the tee boxes range from very close to not to far from the previous green. The course does not encourage walkers and if you want to walk then it would be wise to play when the course is not t0o busy so you are not accused of causing pace of play issues with all of the elevation. At up to $268 for a round, plus caddie fee plus $60 or so for a tip, it is an expensive day at The Plantation. 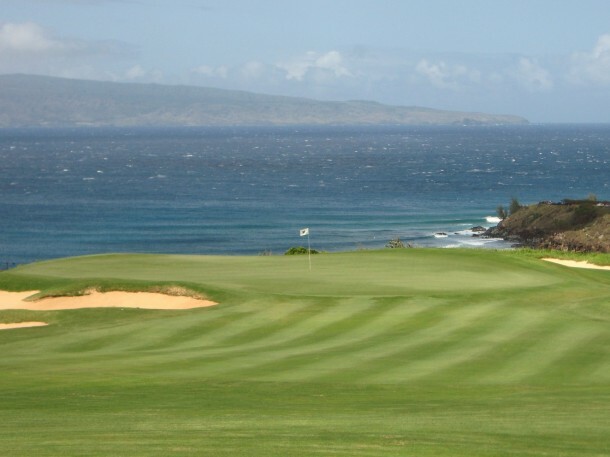 However, if you want to golf while visiting Maui – this is a treat worth taking advantage of whenever you are on the island – at least in my opinion. If you take a cart then it is a lot more affordable, unfortunately. 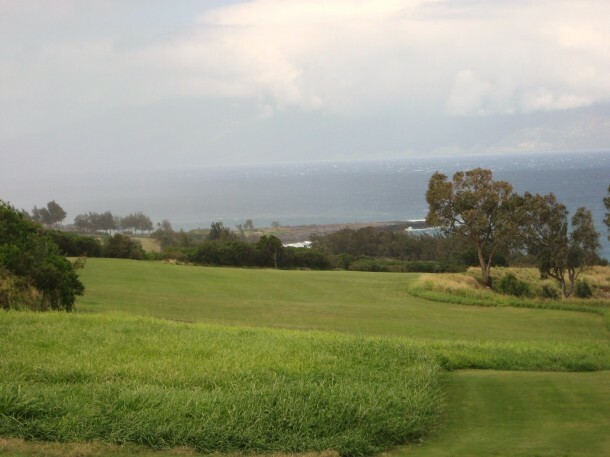 The 11th Tee at The Plantation - surfers, whales and Molokai in the distance. I will let the pictures do the talking . . . for the most part. 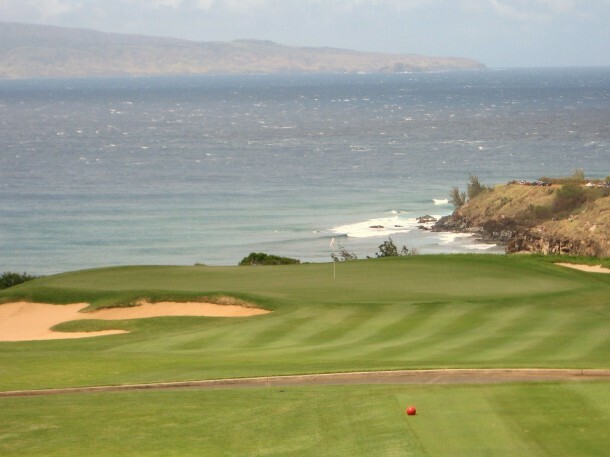 The view from the first tee at The Plantation is captivating. This is a downhill two shotter that plays much shorter than its yardage, especially with a tail wind. 1st Tee at The Plantation. If you drive it too far you will be at the bottom of the ravine with a blind chip up to the green. There is room to work the ball off the bank below the left-side bunkers. 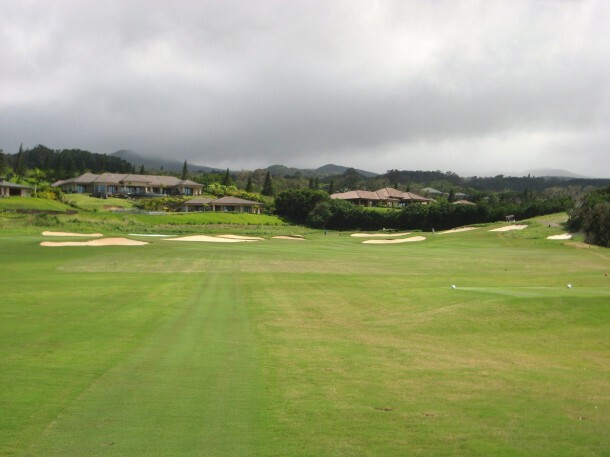 The first is a great intro to various playing characteristics that are revisited throughout the round – elevation change, slope around the greens, firm conditions and a need for ball control to score well. The approach across a chasm on the 1st at The Plantation. Looking back from the 1st Green to the Clubhouse at The Plantation. The second is a flat one shotter that calls for a mid to long iron over several bunkers. 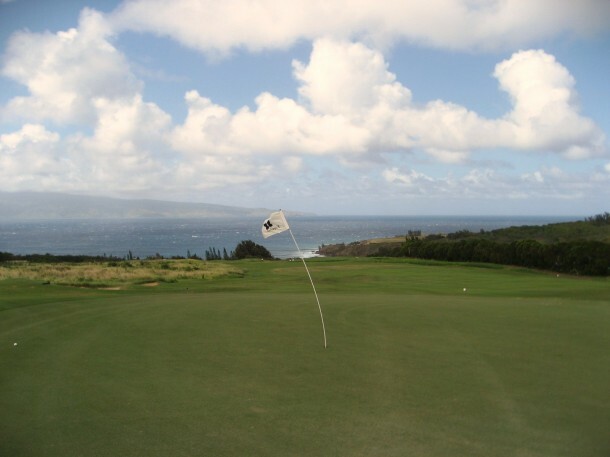 When the wind is up it whips across The Plantation Course - a photo of the 2nd Green. 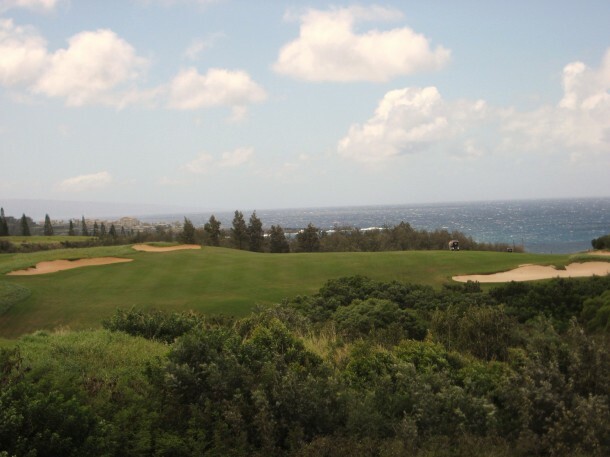 The third hole plays away from the ocean in the opposite direction of the first. It looks short on the card but plays long against a prevailing wind. The fairway is well bunkered on the right side and junk lurks on the left. The 3rd Tee at The Plantation Course. The approach must be accurately flighted to avoid deep bunkers on either side of the built up green. Approach to the 3rd Green at The Plantation. Take in the gorgeous view before turning towards the uphill fourth. Looking back from the 3rd Green at The Plantation. 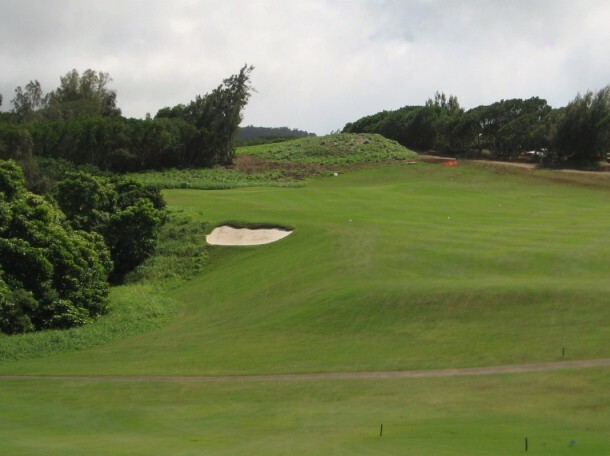 The Plantation has a bunch of fun tee shots – both uphill and downhill – if you keep it left of the bunkers you should be in a good position for the approach. The ground works right to left across the front of an open green. Bump and run may be a good option. 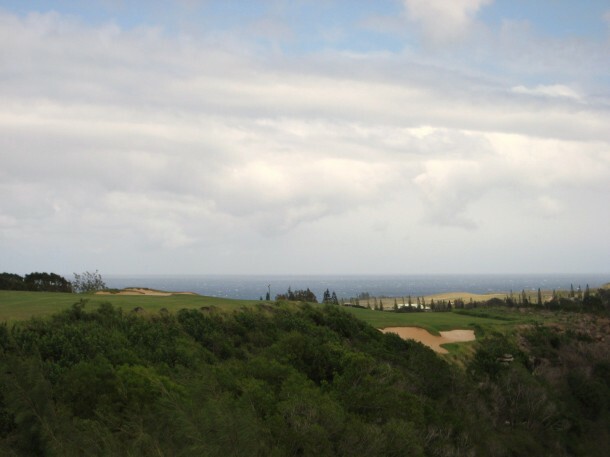 The fifth has a gorgeous view from the tee back towards the ocean and across the adjacent valley to the sixth green. The tee shot is rather daunting because of the steep fall-off to the right and the slope of the land towards said fall-off. A drive towards the left side of the fairway is a good play – the ball will probably work its way back to right. View along the right side off the 5th Tee at The Plantation. 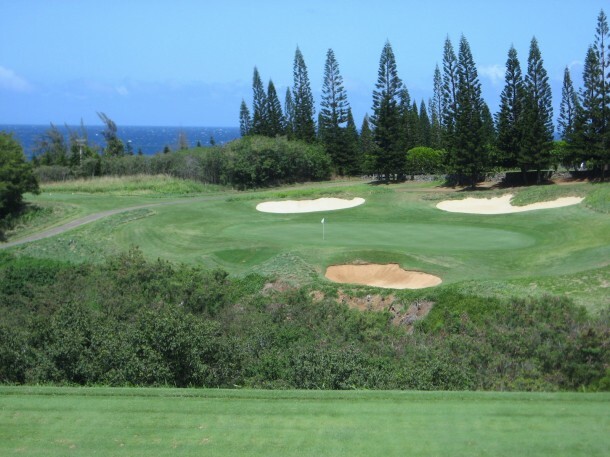 The approach must cross a deep chasm and/or deep bunkers that surround the green – that makes two thrilling shots on one hole. The well protected 5th Green at The Plantation. The sixth tee lies, literally, across the valley from the fifth green. Even if you have a looper, this is the first “cart transfer” that is unavoidable. 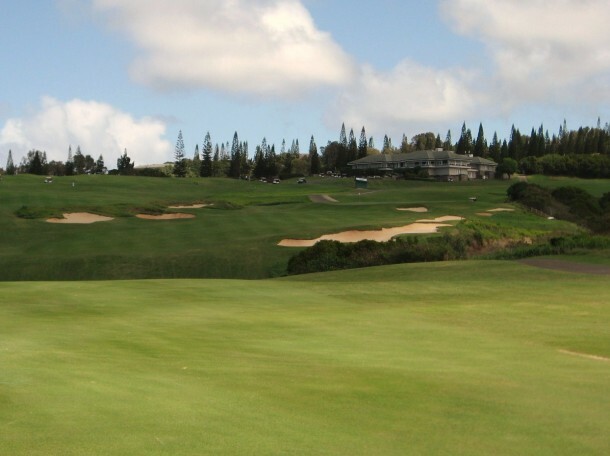 The drive on this two shotter can reach the green if it lands just to the right of the central fairway bunker and takes a nice hop down the hill. The driveable 6th Green is just over the hill in the distance. 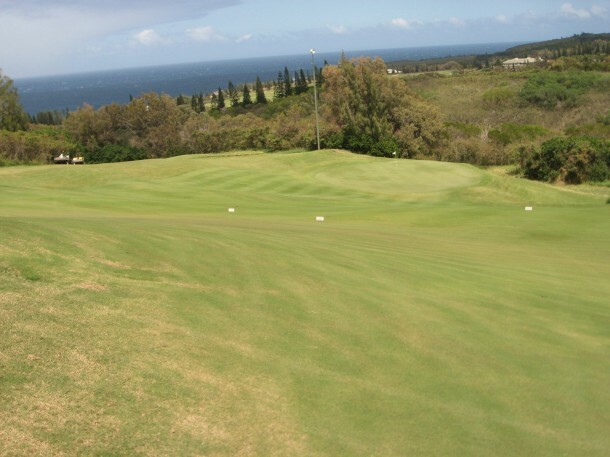 The green sits in an amphitheater with a sharp drop off on the right side and junk beyond. Downhilll approach to the 6th Green. We continue downhill on the long two shot seventh that has, believe it, a potentially driveable green if you crush a perfect tee shot with a tailwind. I ended up about forty yards short getting some huge roll on a solid drive. A huge slope awaits just beyond the tree on the 7th at The Plantation. The view as you crest the rise is incredible – while the downhill approach can be daunting. Bunkers left and right, along with a steep fall off over the back, must be negotiated carefully. Don't get distracted by the view behind the 7th Green. A do or die one shotter with very little room to bail out. 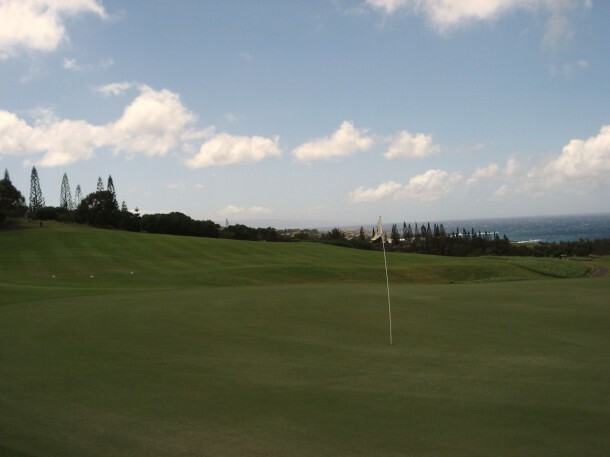 When the wind is up – this is a challenging long iron to a two tiered green with the grain running towards the ocean. Three is a great score. A cart is sent out to transport you and your caddie from tee to green. View from the 8th Tee at The Plantation Course. Into the wind, the ninth is a beast. 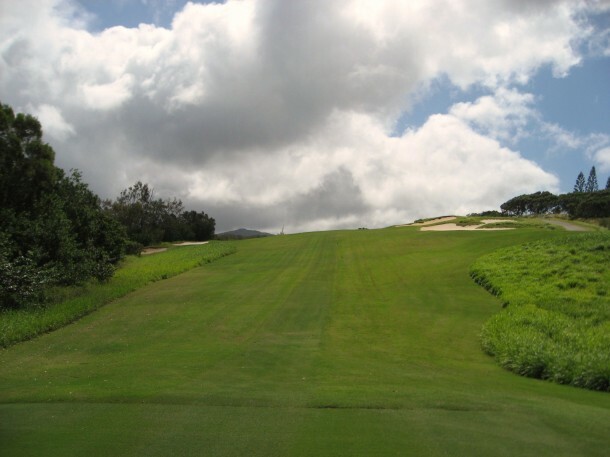 It plays back up the hill towards the clubhouse adjacent to the first. The 9th is definitely a three shot hole. If you go over the green, and need to chip back, it is likely that your ball will end up 50 yards down the fairway, no matter how deftly you play it. Don’t ask me how I know . . . The second must cross the ravine and avoid fairway bunkers on either side. The tenth tee is a long drive from the ninth green – this is the final “cart transfer” that the walking golfer has to deal with. 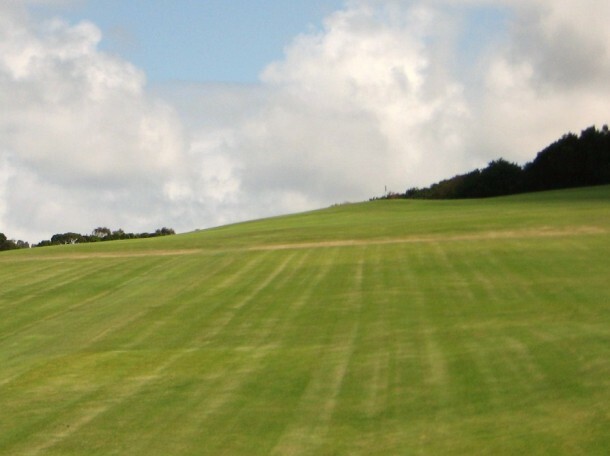 Like the fourth, the tenth calls for a blind uphill drive that tracks towards the right side of the fairway. 10th Tee shot at The Plantation. The short to mid iron approach can be worked from right to left on to the green. Looking back from the 10th Green at The Plantation. A beautiful but challenging short one shotter. The picturesque 10th at The Plantation. Another potentially reachable two shotter with a perfect drive. Tournament tees on the 12th at The Plantation. A good drive will leave a short pitch to the green which is well guarded – unless you drove it in the bunker, in which case you need to blast it out. Approach to the 12th at The Plantation. Thirteen plays back into the prevailing wind to an elevated green canted from right to left. 13th Hole at The Plantation. 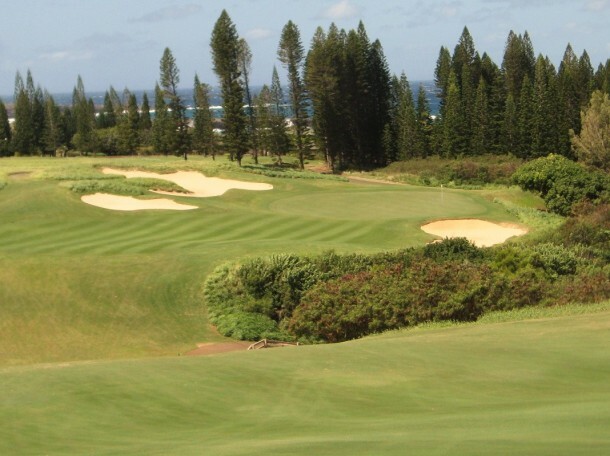 The uphill fourteenth poses a tough question on the tee – go for power or go for placement. A hybrid or fairway wood off the tee can leave a wedge to the green while a crushed drive can almost get there. A couple of Tour pros drove the green during the SBS Championship. 14th Tee at The Plantation. This is the smallest green on the course. 14th Green looking back to the Pacific. 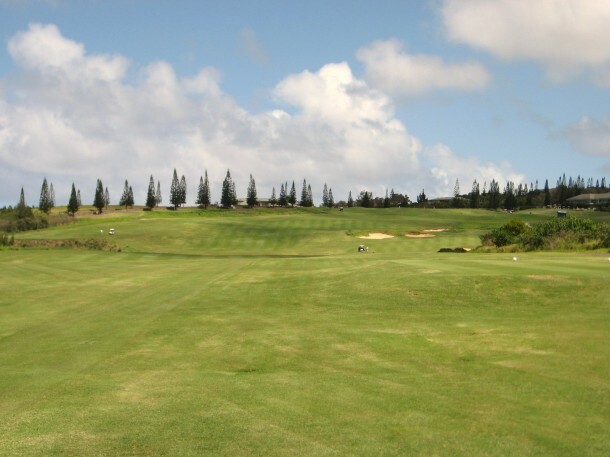 After a short walk across Honokahau Street the golfer reaches a formidable par five. The hi-lite of the 2010 SBS Championship, at least for me, was watching Geoff Ogilvy reach the green in two off a downhill/sidehill lie on Sunday. 15th tee shot at The Plantation. As you walk around the corner of the right hand dog leg, a very challenging second awaits. 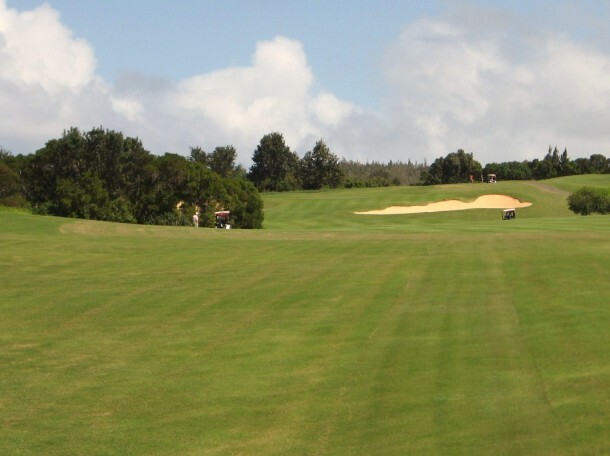 15th Fairway at The Plantation. A fairly easy two shotter before the crescendo that is 17 and 18. 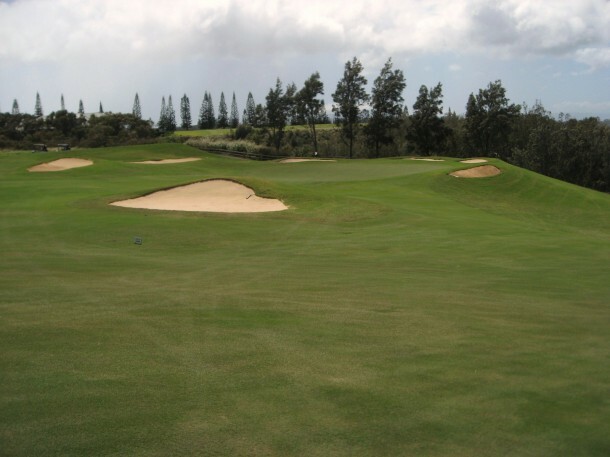 There are two fairways – the obvious one on the right and another on the far side of the fairway bunkers. 16th tee shot at The Plantation. 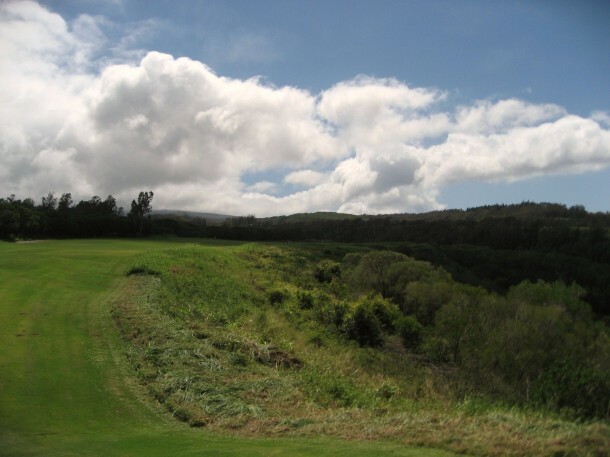 The 17th is jaw-dropping – a 500 yard downhill par four that will produce 300+ yard drives if you keep the ball in play. A drive from the top of the property to the Pacific on the 17th. 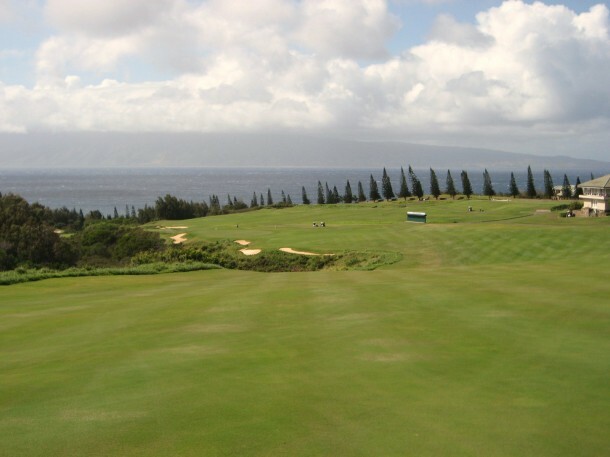 Similar to the 18th, the second will traverse a ravine and move right to left towards the green. Approach to the 17th at The Plantation. Looking back towards the tee. Looking back from the 17th Green at The Plantation. The eighteenth must be one of the most recognized holes that the PGA Tour visits on an annual basis. A 400+ yard driver is possible and the green is reachable in two despite the distance. 18th Tee at The Plantation. How much should the golfer bite off on the second? You might as well take a rip if you do not play here often. 18th Fairway at The Plantation. A nicely drawn fairway wood can catch the slope, run onto the green and give you a look at eagle. Eagle putt on the 18th. 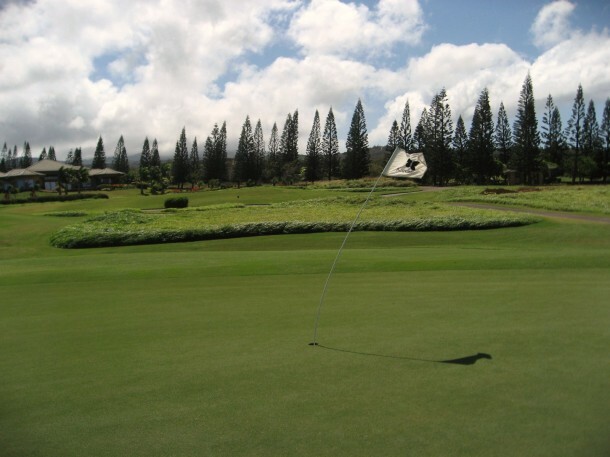 Remember that on these greens, no putt is a gimme. Looking back from the 18th green at The Plantation. 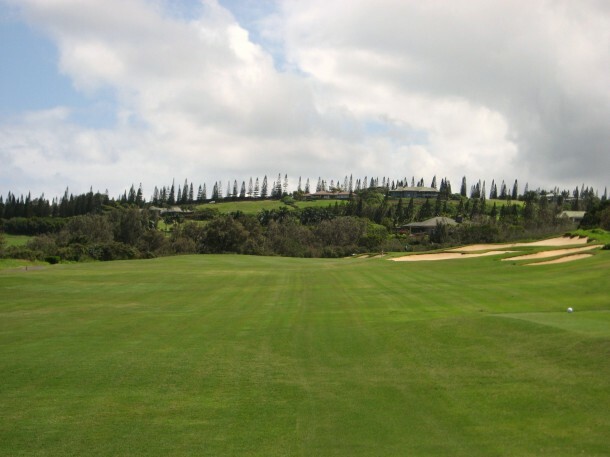 Kapalua Plantation, as you can see from the photo tour, is not an easy walk – but it is certainly manageable if you are in shape. Aside from the three “cart transfers” which are less than ideal, I have definitely walked more challenging courses, although I have never paid so much to do so. 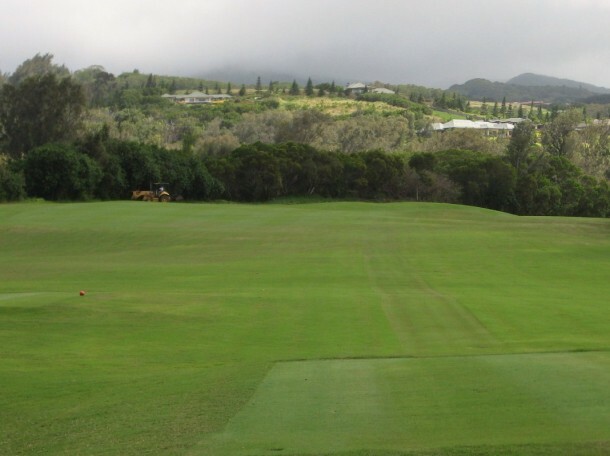 The Plantation is essentially unwalkable, it is pretty much a cart golf course, however the architects have created a routing that can be walked “with help”. So if you are determined to walk it then you will have to pay for a caddie, but the experience will be superior – in my opinion. 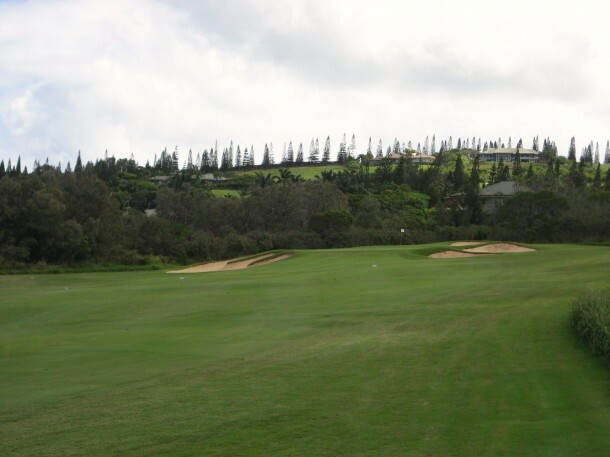 The course receives a 0 out of 4 for Walkability because of the necessary “cart transfers”, but that does not mean it cannot, or should not, be done. 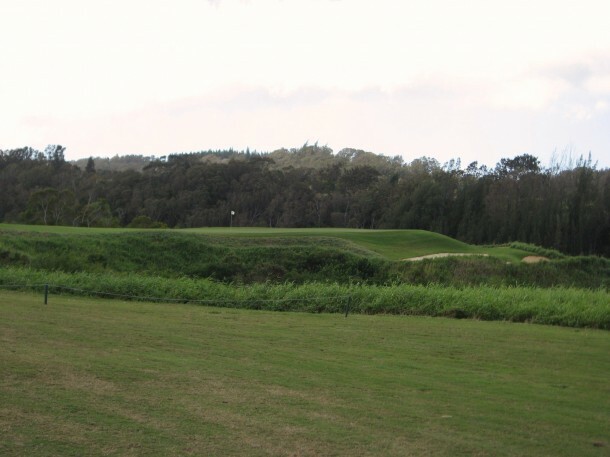 The Architecture at The Plantation is fantastic – I have heard many walkers say that this is their “favorite cart golf course in the world.” C&C did a masterful job with fairly extreme terrain and created a fun yet challenging track that should be experienced at least once. 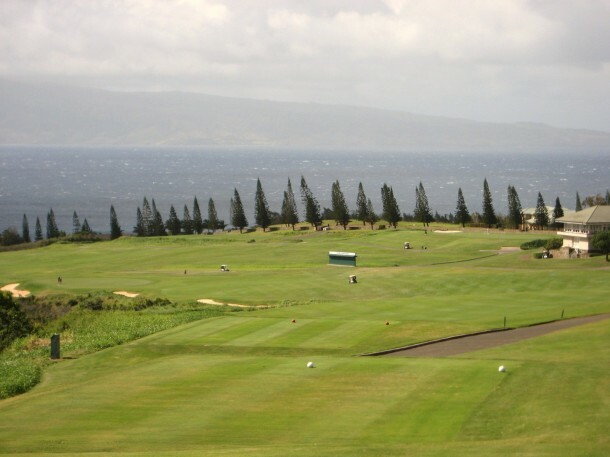 Aesthetically, The Plantation is incredible with views of the Pacific, Molokai, whales, surfers, and the West Maui Mountains. The course flows naturally over the landscape although it must have been a daunting challenge to construct. 1.5 out of 2.0 for Architecture and 2.0 out of 2 for Aesthetics. 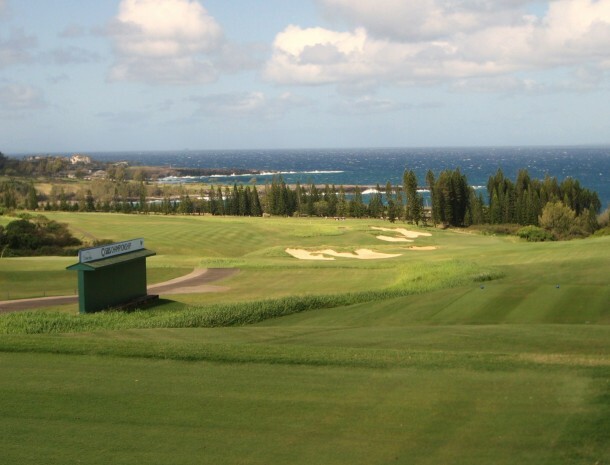 Precise tee shots and accurate irons are vital to score well at The Plantation. 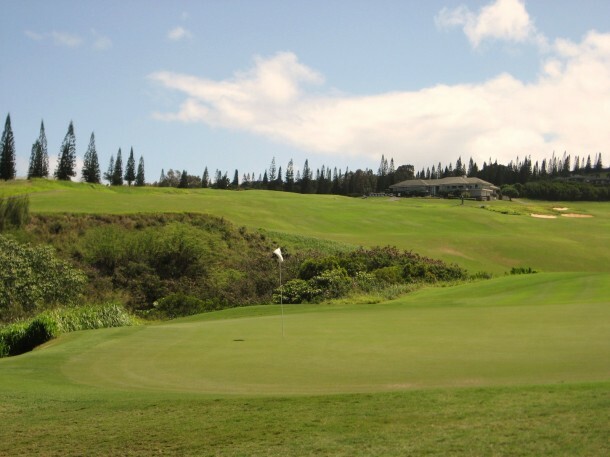 Most holes present multiple options to the golfer and the wind makes the course play differently everyday. 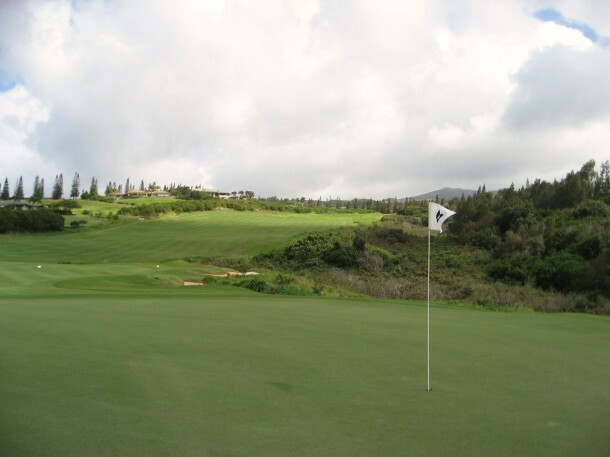 The course is playable for golfers of all levels if you do not bit off more than you can chew. My wife had one of the most enjoyable rounds of her life and she only gets out to play from time to time. Expect to score higher than your handicap and just have fun. 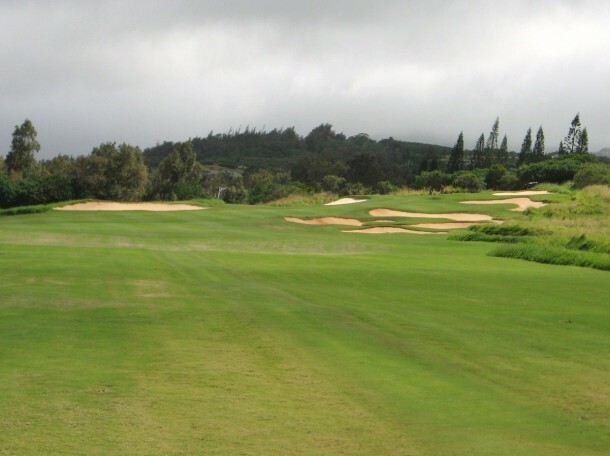 The Plantation gets 1.5 out of 2.0 for Strategy and Playability from The Walking Golfer.